The severe shortage of small change that plagued Canada during the 19th century prompted many merchants to issue private tokens. Designed for strictly local use, these tokens passed from hand to hand until redeemed by the issuer for some specific service or commodity or for a discount on a purchase. Tokens were also good advertising, and it was this feature that ensured their continued use long after small change had become readily available. The token featured is one such piece. Struck in brass, it was issued by Samuel T. Anckorn, a barber in Owen Sound, Ontario. Samuel Anckorn started work in Owen Sound as a blacksmith around 1888. Discarding his anvil for a razor, he became a barber in 1892 and remained in that profession through the first decade of this century. 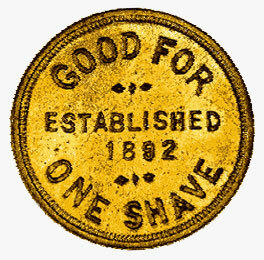 The reverse of the token indicates its value - GOOD FOR ONE SHAVE - and the date when Anckorn established his business. The obverse carries the name of the merchant, his profession and place of business. About the size of a 25-cent piece, this coin forms part of the National Currency Collection, Bank of Canada.